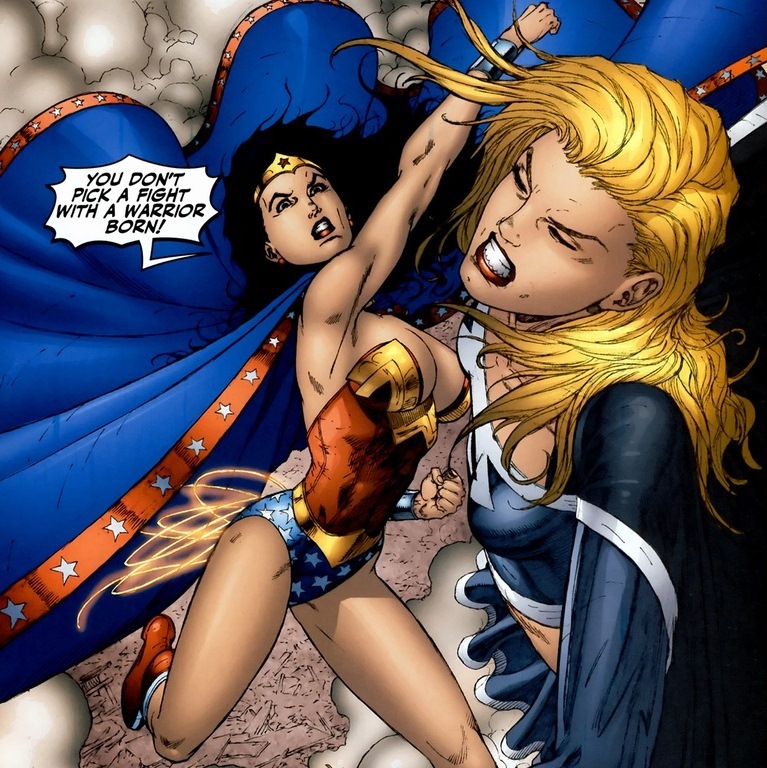 On Monday, we dealt with Supergirl’s alternative, bustier twin. Let’s check in with the real deal. 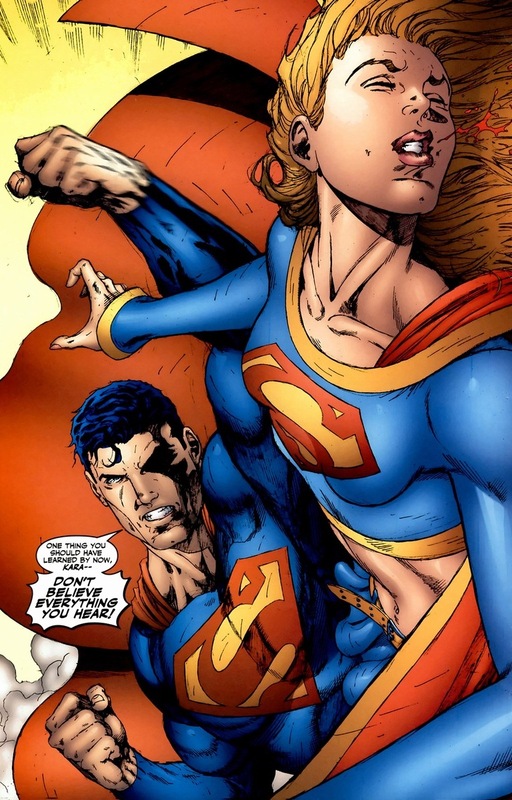 The history of Supergirl (real name Kara Zor-El) may actually be one of the most complicated histories in the history of DC. She’s gone through so many weird iterations and origin changes that I can’t begin to explain (or understand) it. 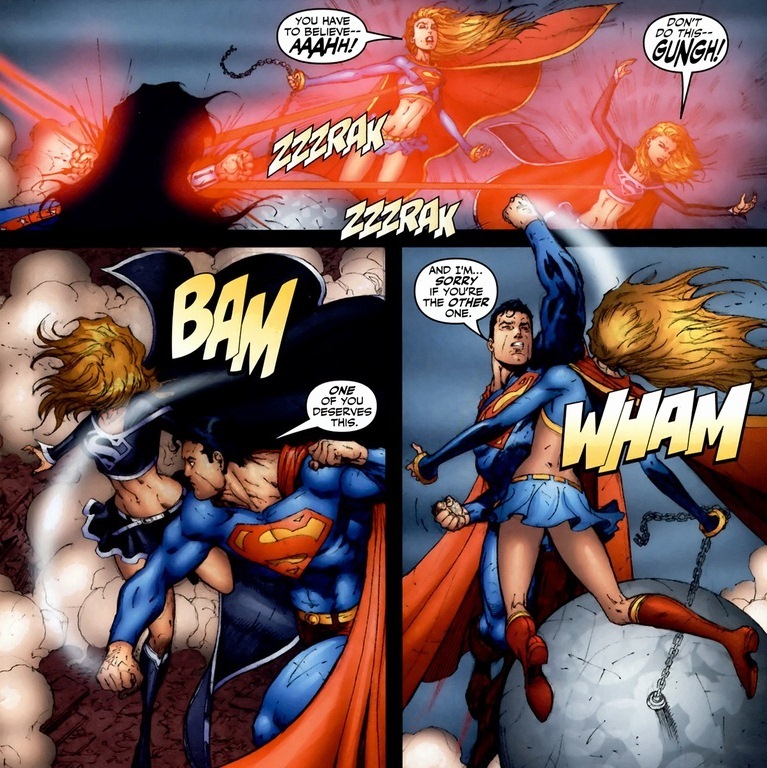 But in 2004, they reset her origin in Superman/Batman #8, once again making her Superman’s cousin that was trapped in her spaceship’s suspended animation for decades. 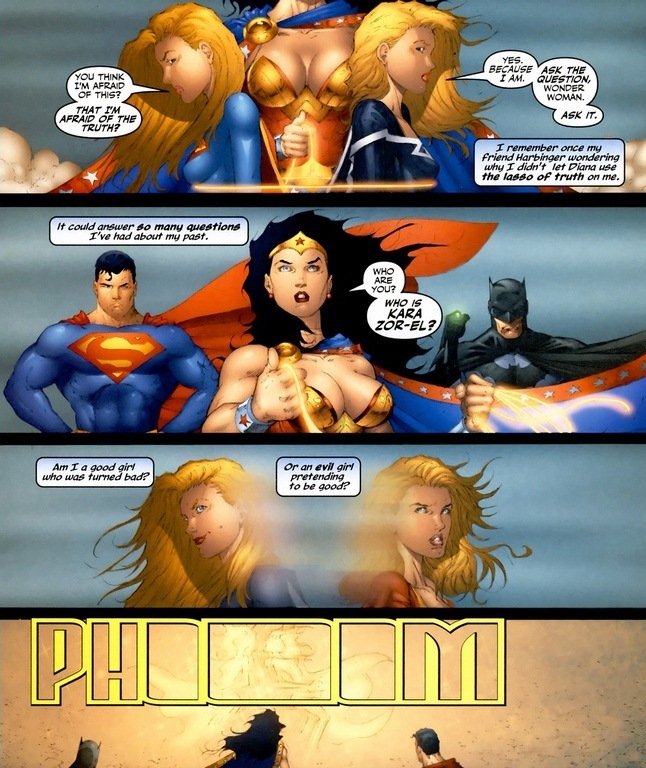 Hence why she immediately has her Kryptonian powers (that Superman developed throughout puberty) and she’s the same age as when she got evacuated from Krypton (still sixteen years-old despite Superman having aged thirty-five years or so). 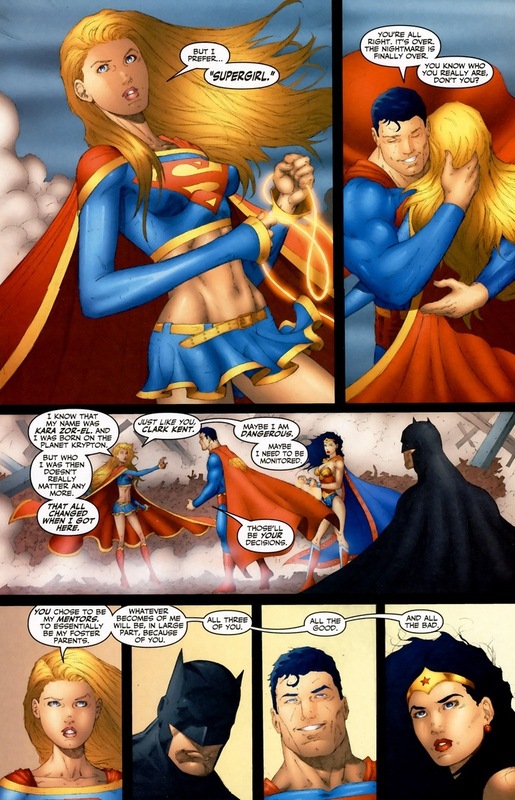 And if you get a chance, definitely read her introduction arc in Superman/Batman. It’s so good they made an animated movie about it. Lots of cool fights. 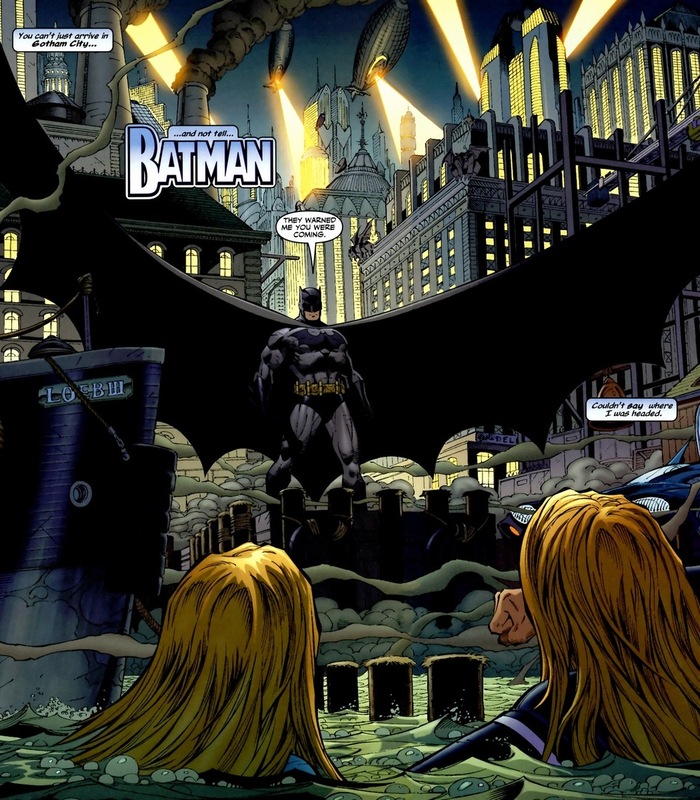 Batman threatening Darkseid. 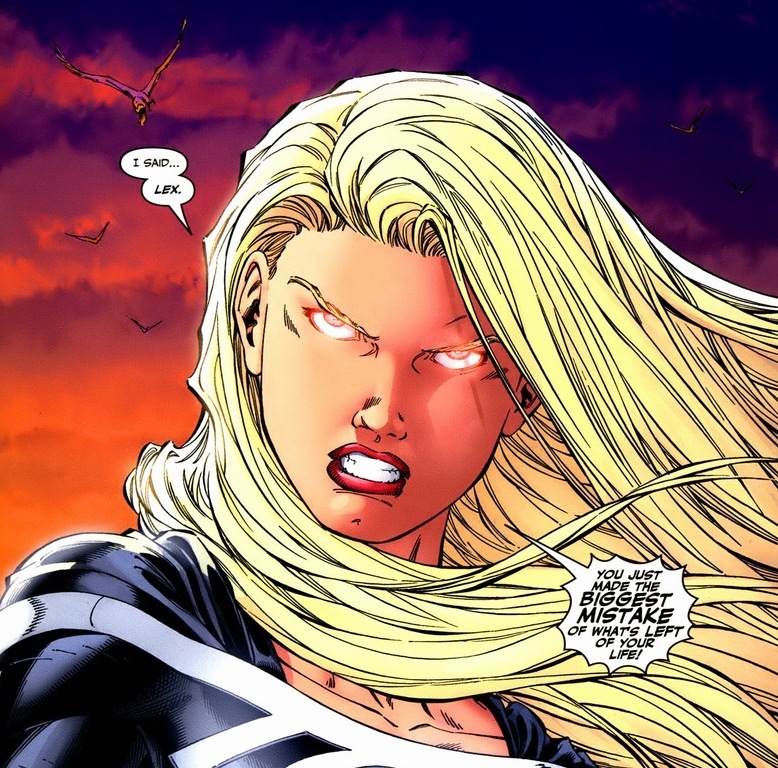 An evil Supergirl. 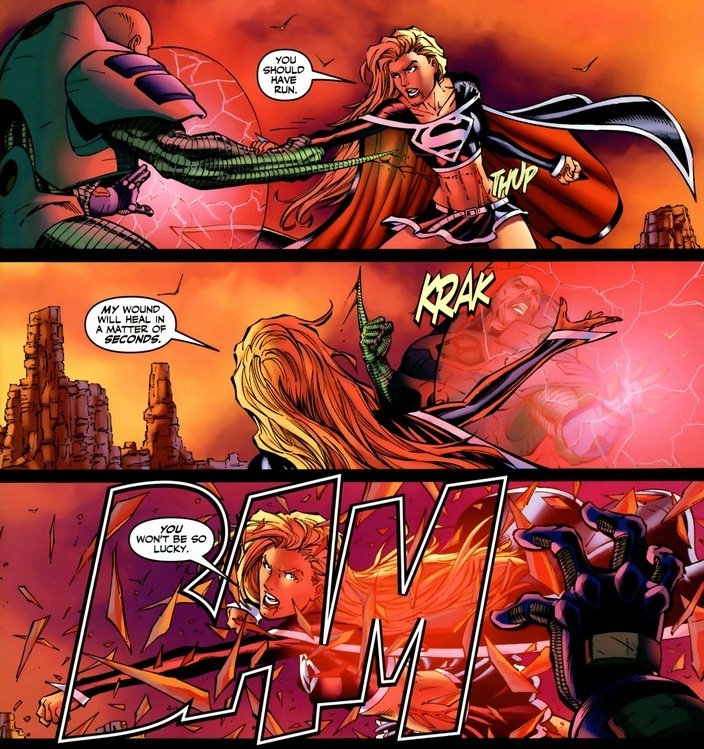 Unfortunately for Kara, that whole evil persona thing didn’t really get solved until Supergirl #3-5, written by Jeph Loeb and drawn by Ian Churchill. Baby steps, though. 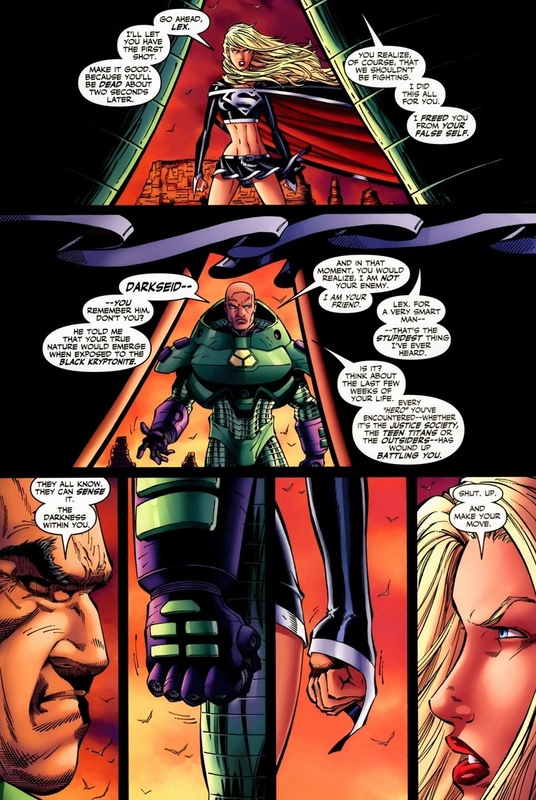 First, she decides to have a chat with Lex Luthor. If you’re not caught up on comics, this is not your grandpa’s Luthor. No longer the zany mad scientist with a bitter grudge, Luthor has evolved brilliantly in the past few decades into an extremely capable, powerful psychopath with a bitter grudge. Megalomania aside, don’t mess with Luthor. He’s Superman’s arch-nemesis for a reason. That and one more trick up his sleeve. 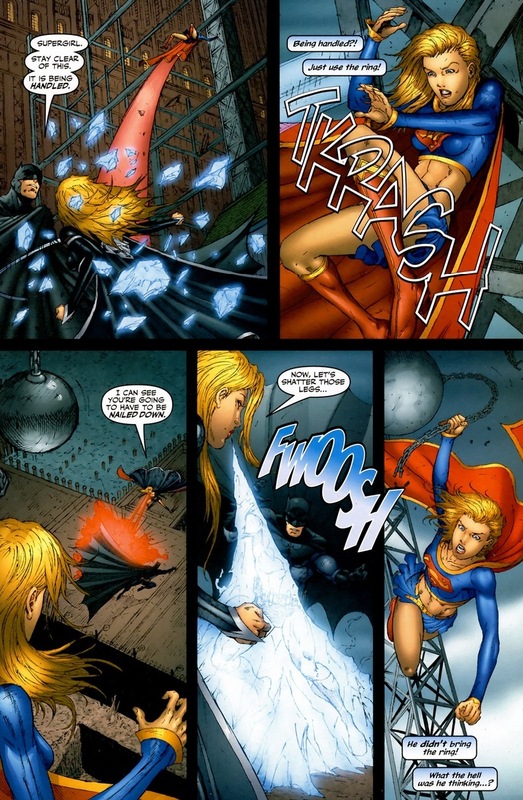 Did you know black kryptonite creates a second Supergirl that’s all foul and no sunshine? 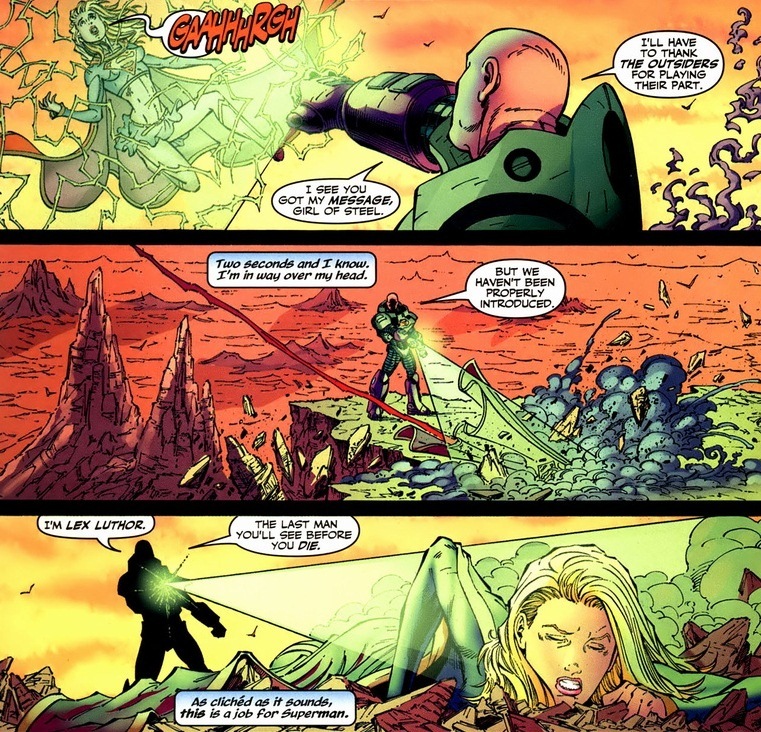 With a single punch, the fight changes setting to the Justice League Watchtower on the moon. She hits hard. 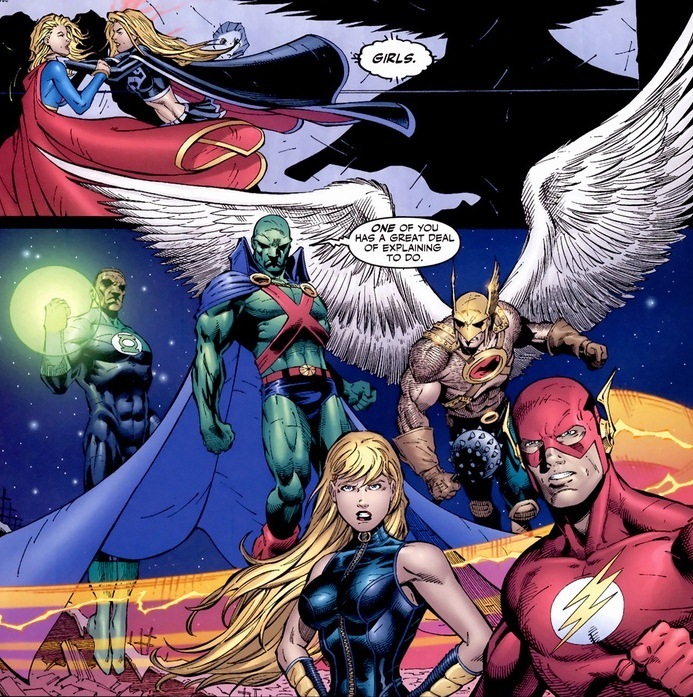 You don’t get to see the JLA fight, sadly (buy the book for that), but just know that evil Supergirl takes down Green Lantern, Flash, Hawkman, Black Canary, and Martian Manhunter by herself. It’s impressive. 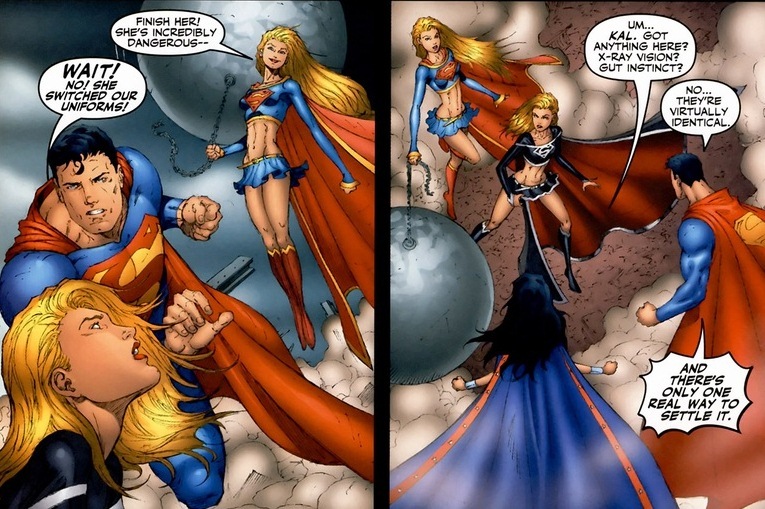 Finally, the real Supergirl recovers and joins the fight. 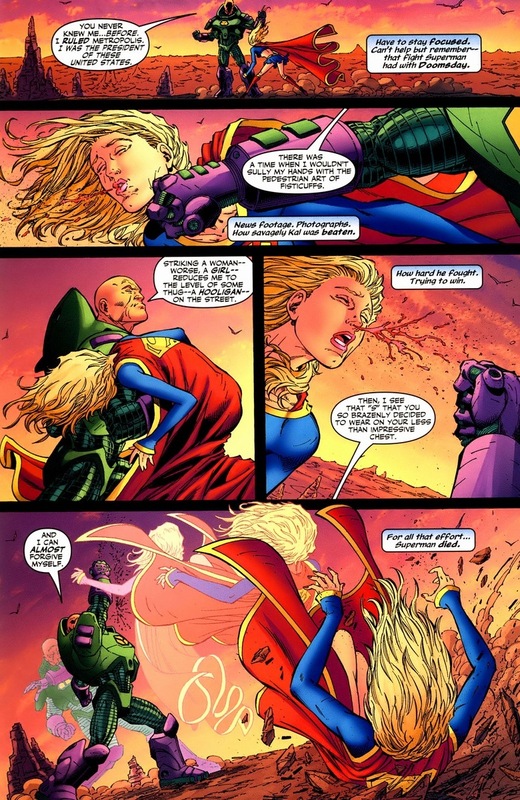 Evil Supergirl still going strong and the JLA about to take a second beating, Kara brings to fight to the one person that she knows can defeat her evil twin. You can click the picture for a bigger version if the text’s hard to read. 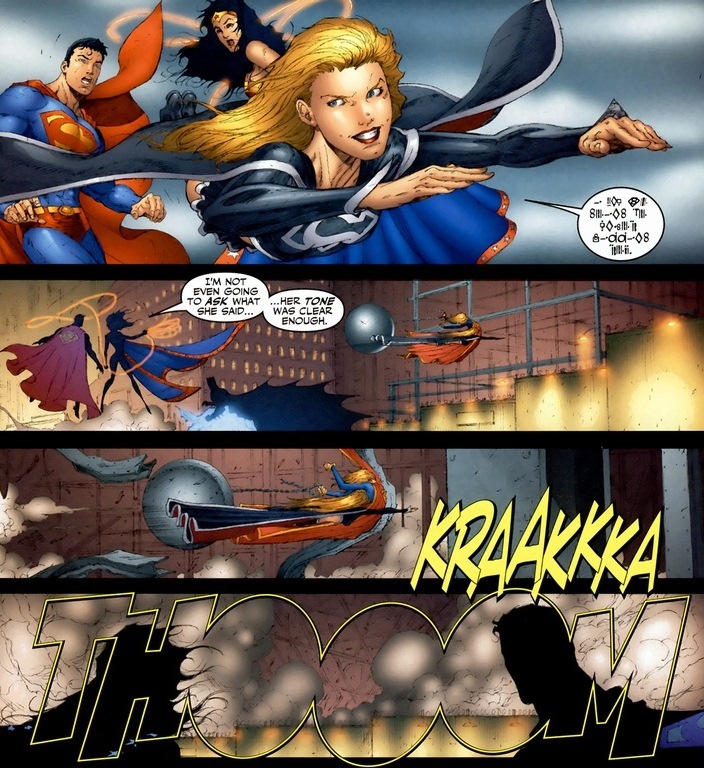 With evil Kara now outnumbered four-to-one, each of her opponents absolutely capable of defeating her, she switches her strategy. To sneakiness. 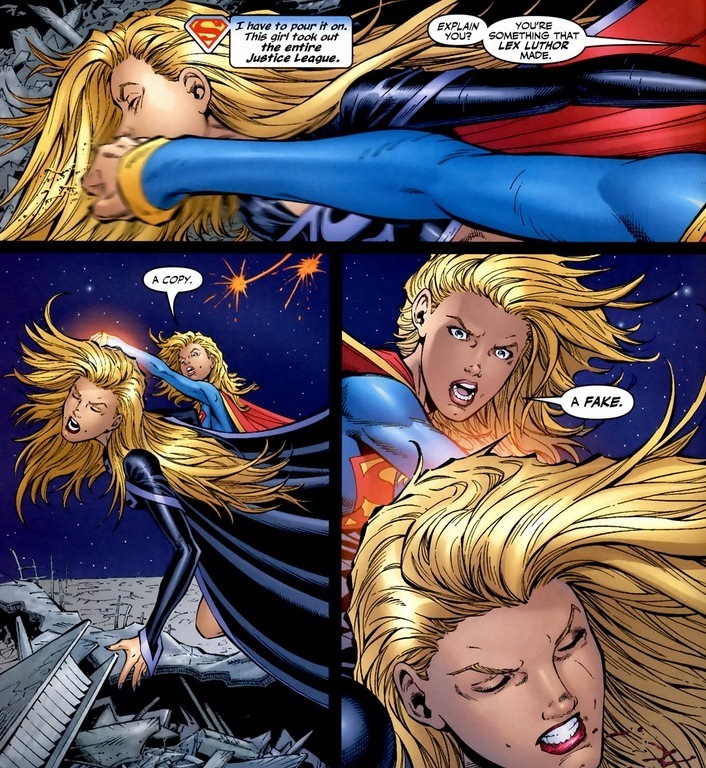 Which one’s the real Supergirl? I dunno, the one smugly smirking? Superman, not exactly the world’s greatest detective, figures he’ll solve the problem the only way he knows how. 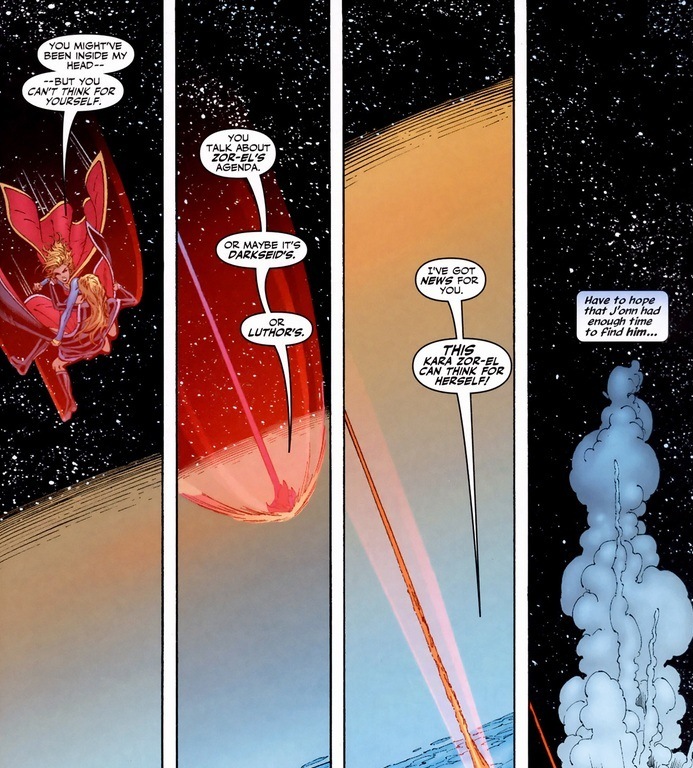 And now witness one of the coolest Superman moments in comics. 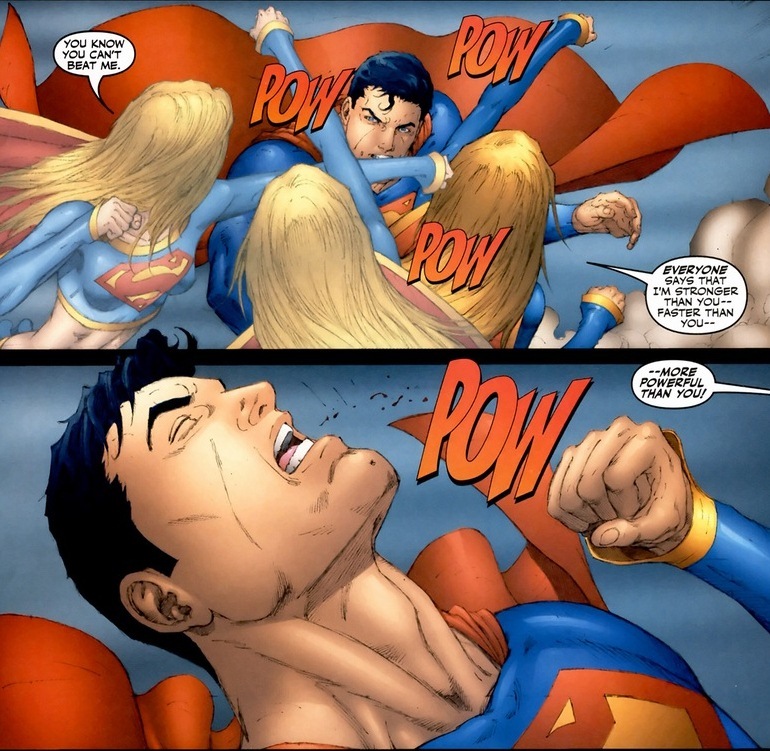 You may bash Superman for his blatant morality, clumsy secret identity, and underwear outside the pants, but you can never bash him for his strength. The most powerful being on the planet. 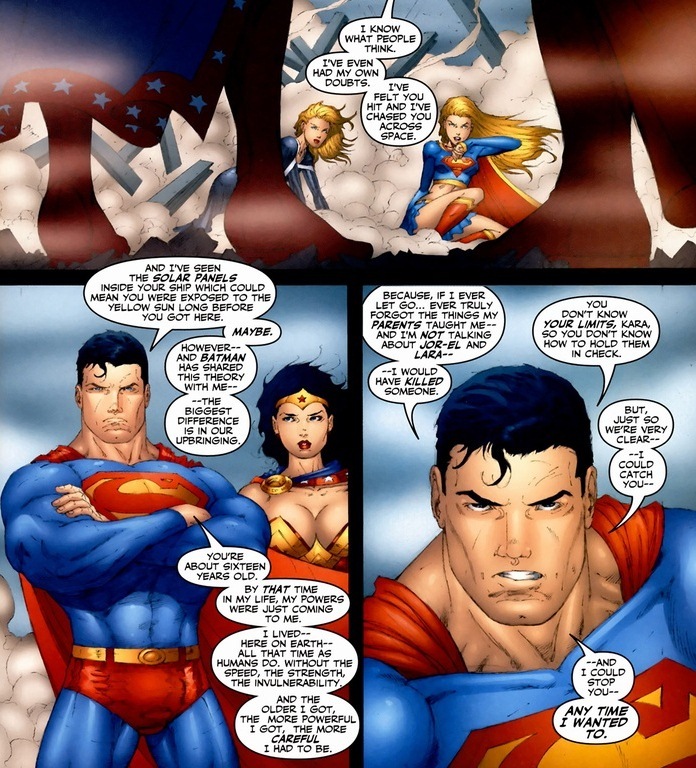 Nothing better than Superman putting someone in his or her place. 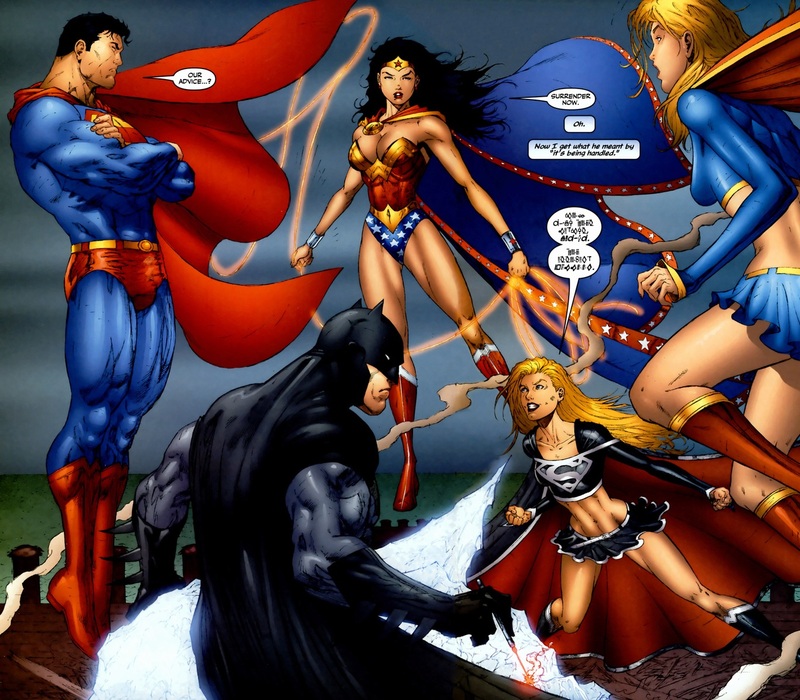 Realizing the gravity of the situation, the Supergirls agree to be magically bound by Wonder Woman and take their 50/50 chance of replacing the other one. The winner? Duh, you already know the answer, but it’s much more fun to have it decided in a dramatic, totally necessary explosion. Feel good stuff. Plus, just like all good teenager stories, she even recites the life lesson she learned on today’s episode. Listen for the music to swell. Now officially a genuine superhero. Saving the day as soon as she finishes biology class. 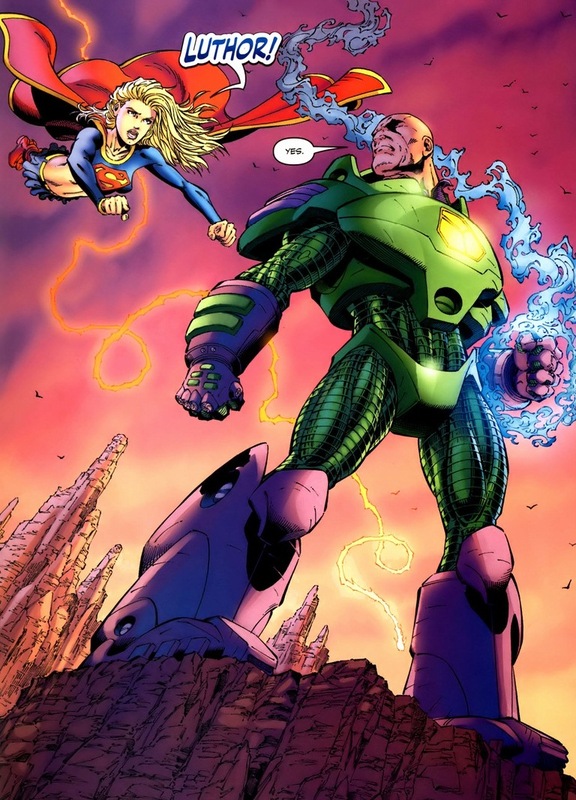 Can you recommend me some good comics starring Lex Luthor? Yessir. The Lex Luthor: Man of Steel miniseries is one of the best Luthor comics ever written. He also became the main character of Action Comics #890-900 and it is spectacularly well-done. 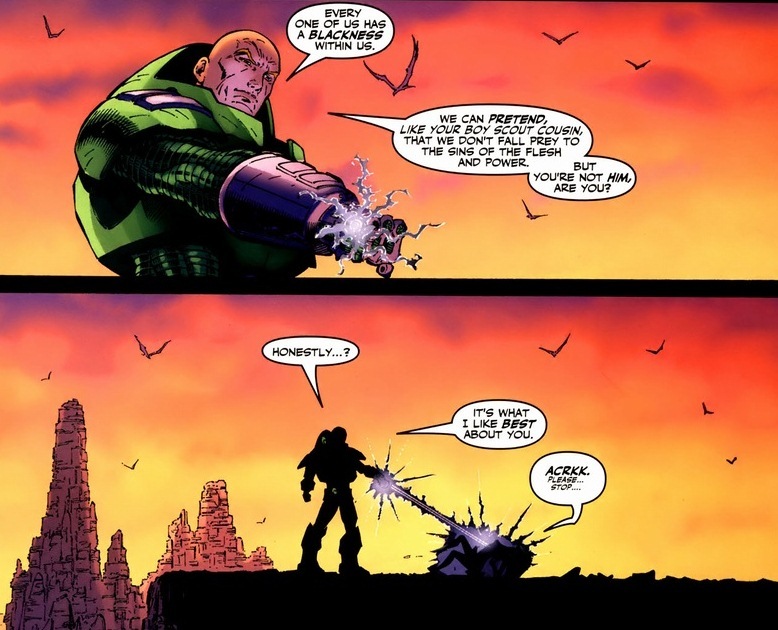 Luthor rocks.